Surrounded by impressive stone walls, elaborate and ornate Biblical images, with bold colors streaming through stained glass windows, the faithful bow their heads in prayer. Seated in the wooden pew of the Foundry United Methodist Church in Washington DC is a humble woman of faith. At this moment, she is not a former First Lady, Senator or Secretary of State. She is not a presidential candidate or any type of politician at all. At this moment, she is Hillary Clinton, follower of Christ. Many politicians use their religious affiliations as their pulpit or platform to influence voters or to give themselves credibility, but being a Christ-follower is more than just lip-service or a club membership. Being a Christian isn't something that has to be professed through catchy phrases on a bumper sticker or an overtly Christian image on a t-shirt. True Christianity is not shouted from a hilltop, but whispered in the actions of the follower. Christianity is detected through action. Waving a Bible doesn't get the minimum wage raised or feed hungry kids. Waving a Bible doesn't give sick people the health care they need, nor does it help the less fortunate. Christianity is seen when those who follow Christ and profess their faith demonstrate the very nature of the Lord in their outward actions and personal interactions. The Bible is clear that we, those who profess their faith in Christ, are to be the human, active, mobile hands and feet of Christ. We are supposed to do more than tell the world that we are Christians. We are to treat others in a way that is consistent with Christ himself. In others words,"faith by itself, if it is not accompanied by action, is dead" (James 2:17 NIV). This commitment to being a concrete and tangible ambassador of Christ is the difference between Hillary Clinton and other politicians. Hillary Clinton, though she has been relatively quiet about her spiritual life, has had a life long career of action and decisions in both the public and private sector, that reflect her faith. She possesses a track-record of actions that make peoples' lives better; actions that make changes in policy and procedures. Like Hillary Clinton, I was raised in a Christian home. And like her, my faith has always been a big part of what defines me personally, professionally and politically. As with all other major areas of my life, I don't take the decision of who to vote for or endorse for president lightly. After a lot of observations, much consideration, research and personal interaction with Hillary Clinton, I can say with confidence that I can endorse her politics, policies and ideas. In fact, my Christian faith obligates me to vote for Hillary Clinton. Recently, in a small town in Iowa, Clinton opened-up about her otherwise personal spiritual journey. "I am a person of faith. I am a Christian. I am a Methodist,"she began. 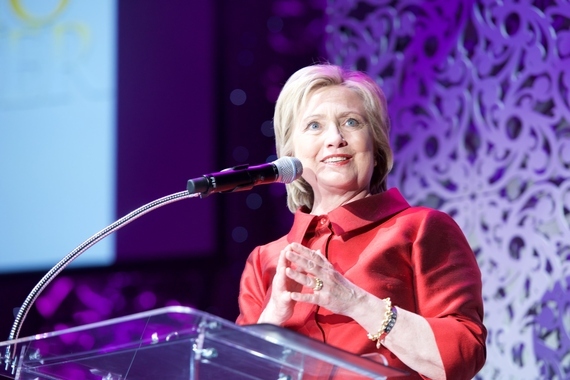 Clinton continued to discuss her personal faith and referred to the Biblical story of the Sermon on the Mount. "There's a lot of great Bible studies: What does the Sermon on the Mount really mean? What is it calling us to do and to understand? Because it sure does seem to favor the poor and the merciful and those who in worldly terms don't have a lot but who have the spirit that God recognizes as being at the core of love and salvation," she continued. And this is exactly what Clinton lives. Clinton's actions and attitudes about assisting those who are less fortunate shout volumes about her character and her relationship with God. She has lived a life long career of positive actions, reactions and decisions, in both her public and private life, that reflect her deep seeded faith. She possesses a track-record of resolutions and responses that make peoples lives better; actions that make a change happen for those who need it the most and who can not make it happen for themselves. While in Arkansas, Hillary co-founded the Arkansas Advocates for Children and Families, an organization that advocates for the health, education, and welfare of children. Additionally, Clinton served on the board of the Arkansas Children's Hospital and was instrumental in helping the hospital grow to become one of the nation's ten largest children's hospitals. Clinton also served on the board of the Children's Defense Fund. She brought a preschool program to poor families in the state and aided families in small towns and rural areas to gain access to health care. She worked tirelessly to increase the quality of education for the children of the state of Arkansas. As first lady, Clinton continued her faith-directed service to others. She chaired a Task Force on National Health Care Reform, which she hoped would provide quality health care for everyone. In addition, Clinton, along with Senators Ted Kennedy and Orrin Hatch, was a driving force behind the passing of the State Children's Health Insurance Program. This federal program provided state funding support for health care to children whose parents could not afford to provide it for their families. First Lady, Hillary Clinton also helped in the creation of the Office on Violence Against Women, a component of the Department of Justice, which exists to help reduce violence against women and to administer justice to victims of domestic violence and other violent crimes. In addition, Clinton was a force in the passing of the Adoption and Safe Families Act. This is yet another way that she has helped aid the less fortunate. As Senator, Clinton called for an investigation of hidden sexual scenes in video games that are inappropriate for, yet accessible to children. And she networked with other Senators from both parties at the Senate Prayer Breakfast, putting faith before politics once again. Hillary Clinton has a proven record of public service that is undeniable and irrefutable. She has devoted her life to serving others in a variety of capacities, just as she was taught in Sunday School so many years ago. I don't believe we need a president who makes choices based on their religion that affects America as a whole, I believe we need a President like Hillary Clinton who will pull from the love and compassion of what her faith has taught her into making the world a better place for all people, regardless of their religious affiliation or lack there-of. The Bible says, "For unto whomsoever much is given, of him shall be much required," (Luke 12:48 KJV). Hillary Clinton has not taken this concept lightly, nor has she abused her titles or ignored the responsibilities associated with her positions. She has proven herself to be a public servant with a heart for the people. And as President, I predict that she will wash the feet of the beggars and will dig trenches with soldiers. She will feed the hungry in the soup kitchens and will use her Christianity, not as a platform, but as a benchmark. Proverbs 3:27 (KJV) says, "Withhold not good from them to whom it is due, when it is in the power of thine hand to do it." I believe this would define a Hillary Clinton presidency, as much as it has described her life.